Leave a gift in your Will to Canterbury Oast Trust and share in a positive future for people with a learning disability in Kent and East Sussex. Our vision is simple. Care at its best. 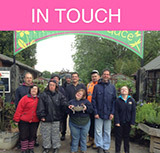 Canterbury Oast Trust was founded with a passion for supporting adults with a learning disability and, together, to be a strong voice for change. They gave us a history to be proud of and the prospect of an exciting future ahead. Our charity has empowered many people with a learning disability to build a life of their own, to have a home of their own, to evolve life-long skills and self-confidence, developing purpose, ambition and aspiration. Be part of our future. enable someone with a learning disability to live the life they choose, in a family home environment, within a supportive community. enable people to make positive changes in their lives by building their skills and confidence and making friends through our inspirational training programmes. to continue to influence Government policy on social care and to increase public understanding of learning disability. Thank you, your legacy will transform lives. * From 5 April 2012, the usual rate of 40% inheritance tax was reduced to 36% if at least 10% of an individual's taxable estate is left to a charity on their death. Please seek advice from your solicitor for full details and rules. The Remember a Charity website is an extremely helpful resource providing guidance for people wanting to remember their favourite charity in their will.